In terms of popularity, the sport of rugby isn’t really at the same level as sports like football or soccer. Oftentimes it’s mainly just thought of as “dangerous,” and because of this many people are too scared to play it. However, the girls on South’s rugby team have discovered that rugby is a truly enjoyable and unique sport that’s accessible to everyone. 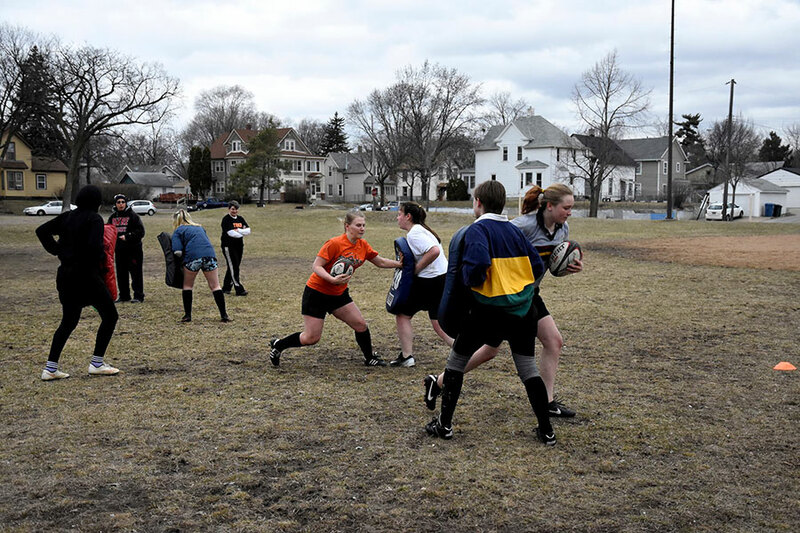 Because rugby is not a sport recognized by the Minnesota State High School League, both boys’ and girls’ South rugby teams are clubs that are part of a wider organization called Minnesota Youth Rugby. Most of the players come from various schools including Washburn, Roosevelt, Edina, and De La Salle. Only three players on the girl’s team are actually from South: Leah Vanek, Ingrid Heard, and Menna’t Bassiony. According to most players rugby is an enjoyable sport for many reasons. Some emphasized the thrill of the sport’s all-out physicality. “I went to my first practice and I was hooked. I’ve never played a contact sport before and I love it, it’s just great,” said sophomore Leah Vanek. Coach Nadine Nader emphasized the importance and satisfaction of the game’s strategy. “Everyone can score. It just depends on how clever you are, and if you understand the game,” Nader said. A big part of learning rugby is knowing how to be safe, and because of this the game is not actually as dangerous as it might seem. “We’re taught well here. We know all the basics and we know how to be safe,” Vanek said. Most players, like Heard, don’t even worry about possible injuries. “I feel like if [I] play it right, [and] stay low I don’t really worry about [getting hurt],” she said. Above all, one of the most unique things about rugby is how accessible it is to whoever wants to play. “We have a real beautiful gift of athletes here,” Nader said, “And the game is so open to all kinds of athletes, whether they have some background, or just have it in them to play hard.” As Vanek believes, “It’s a great way to make friends… [and] it’s accessible to people of all shapes, sizes, and athletic abilities.” Though it’s often thought of as too dangerous of a sport, in rugby there really is a place for everyone. We appreciate all of our readers who would like to interact with the articles we post. We ask that you keep comments relevant, respectful, constructive, and helpful to our staff. We also ask that you refrain from using profanity in your comment. We reserve the right to reject comments that don’t follow our community and comment guidelines. If you notice an error in an article, you may leave a comment with an email address attached. Thanks so much for stopping by and checking out our content!